But it doesn't take much to fix them. All you have to do is download System Cleaner®, the premier software package that's custom designed to get your Windows-based PC performing as if it were factory new, and you're all set. Clean your Windows registry today and experience better computer performance and perfectly optimized computer system. Most common computer errors are due to fragments of old software that are still left in the Windows registry. Cleaning your registry can stop these errors. Is your computer freezing up? This is frequently due to excessive strain on system resources. A well optimized registry can stop this from happening. I had some programs that even that i uninstalled them the right they where leving files on my hard drive. I even spent two hours one time trying to get rid of these files but i couldn't, then i used this program that found and took out these file in less then two minuts. I highly recomend this cleaner. 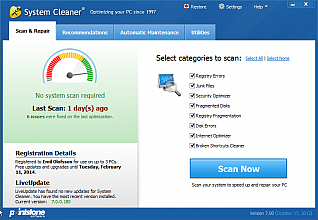 System Cleaner 7 has a brand new interface that allows you to quickly and easily scan for issues on your PC and repair them in a single action. Recommendations provides a list of suggestions that allow to improve your PC performance and optimize network settings. Automatic Maintenance allows you to perform maintenance tasks to keep your PC in top shape. Running in the background, Active Boost automatically improves PC performance by intelligently managing active programs. Checks your hard drives for problems related to bad sectors, lost clusters and directory errors. Defragmenting hard drives reorganizes scattered data, which boosts file access speed and extends the life of the drive. It is recommended that you periodically defragment your hard drive. Disk Wiper wipes the free space of your hard drive to remove any remnants from non-secure deleted files. Free space is unused hard drive space that is not allocated to any current files. However, free space may still contain all or part of files you have deleted. System Cleaner 7 is fully compatible with Windows 8 & 10. Security Optimizer performs a security inspection of critical areas of your PC that leave you exposed to potential outside threats and offers solutions to fix any issues found. This tool will speed up your Internet connection by optimizing various settings specifically for the type of Internet connection you use. Memory Defrag defragments your computer's memory to improve speed and stability. This tool allows to fix common Windows problems. You select the problems that are occurring from a list of typical computer problems, and Repair Wizard fixes them immediately. Optimizes the operating system for SSD Drives. If you use a Solid State Drive (SSD), this utility will allow you to optimize your PC to get the best performance possible. Startup Optimizer delays loading your startup entries so that Windows can boot faster. To delay a startup entry simply drag it from the list below to the delay graphic near the bottom. USB Immunizer allows you to protect your computer and individual USB drives against Autorun worms. Autorun worms are virus and malware programs that infect a computer when an infected USB drive is plugged into the PC. Not sure what's on your computer or how it got there? Disk Cleaner was designed to show you and help you keep your computer running clean. Over time parts of the registry become invalid or point to locations that no longer exist. Registry Cleaner allows you to find and solve all the registry problems that can cause errors and unwanted behaviours with a few simple mouse clicks. After using registry cleaner to identify and remove problems, the recently invalid entries removed leave empty spaces, meaning that the size of the registry remains unchanged. It goes without saying that loading a small registry is faster than a big one.